In St George’s Square, Malta’s National dance company, ŻfinMalta, performed a modern dance exhibition titled Qalbna, with choreography by Paolo Mangiola and original music score composed by Cyprian Cassar. 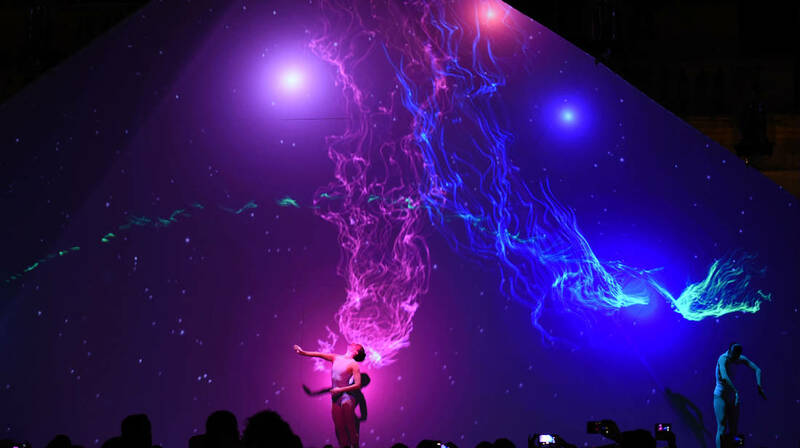 All the while, dancers interacted with visual effects and projected lighting designed by Blaze Animation. The title itself is a playful take on the Maltese word for ‘heart’, which connotes two distinct but related sentiments: ‘our heart’ and ‘amongst us’. The appropriately titled choreography played out in the heart of Valletta, offering audiences a passionate interpretation of what it means to be part of the Maltese Islands, the elements that control it, and the powers that define it. Using the expressive medium of dance, Paolo Mangiola’s choreography offered a narrative that transcended simple plot to explore the emotional and passionate fires that light up the Maltese spirit. In-keeping with ŻfinMalta’s mission to bring dance closer to people and people closer to dance, Qalbna brought this art in close proximity to Maltese audiences who may not generally seek or experience this kind of cultural event. The result was a mix of traditional form, human expression, interactive performance, and technology, where modern dance combined with technological wizardry to present a truly contemporary experience – one replete with digital images, music, lights, costumes and sets that worked together to enhance the medium of dance.